: Jennifer Mulholland in collaboration with Raymond Triquet. : The French Spaniel is a descendant of the bird dogs described by Gaston Febus and used in the Middle Ages. 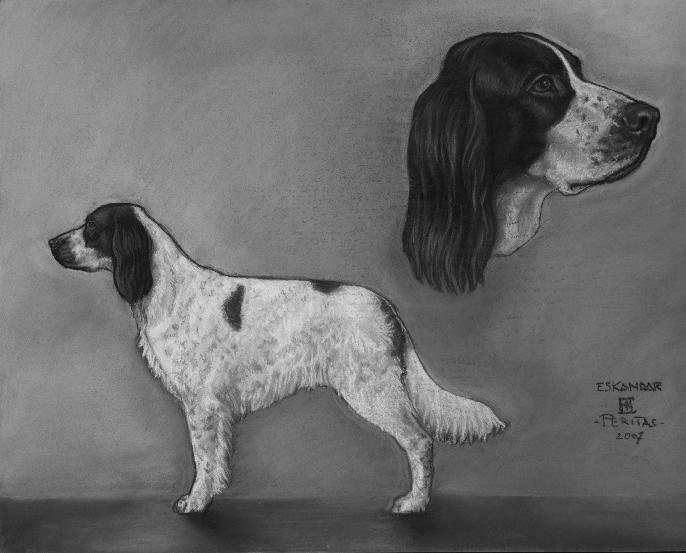 Its ancestors are more than likely at the origin of the diverse varieties of sporting Spaniels. Through selection it developed into the elegant and athletic dog, pointing very firmly, which today excels in working trials. The first standard was drawn up in 1891 by James de Connick; it has been revised several times since, and adapted to the diverse evolutions of the breed. : Medium size dog, elegant and muscled, of medium proportions, of braccoïd type. Its balanced construction provides the energy and toughness essential for its utilization. The bone structure is strong without being coarse. : The length of the body (from the point of the shoulders to the point of the buttock) is slightly superior (by 2 to 3 cm) to the height at the withers. The length of the chest is equal or superior to 6/10th of the length of the body. : Balanced, frank, gentle, calm and docile, enthusiastic hunter, sociable with other dogs and an ideal companion in all circumstances. Excellent pointing dog, it also has a talent for retrieving. : Carried proudly, without heaviness, without excessive leanness and showing well defined outlines. Of medium length and width. : The lateral sides are almost parallel. The superciliary arches are marked. In profile, the axes of the skull and the muzzle are slightly divergent. : Progressive and moderately pronounced. : Brown, well pigmented; with wide open nostrils. : A slightly convex nasal bridge is preferable to a straight one; it is a little shorter than the skull. : The upper lip fits well. Seen in profile, it falls almost vertically at the front and curves progressively up to the only slightly visible but well closed corner of the lips. The upper lip must not cover the lower lip excessively. : Complete dentition. Scissors bite or pincer bite (edge to edge). Scissor incisors are preferred to edge to edge incisors. : The eyes of a cinnamon to dark brown colour, as close as possible to that of the patches, express kindness and intelligence. They are quite big, of oval shape. The brown eyelids are well fitted to the eyeball. The upper eyelid is well furnished with eyelashes. : Well set back at eye level, carried close to the cheeks. Pulled gently towards the front, the end of the cartilage must just reach the base of the nose. The fringes are more or less long and wavy. : Muscled, profile slightly arched, oval cross section, without dewlap. : Straight, well sustained in both action and standing. : Lean, well defined and broad. : Broad, not too long and powerfully muscled. : Broad, rounded, harmoniously sloping in the extension of the loin and without visible bony structure. : Chest: Ample, of great capacity, let down to elbow level. Brisket: Ample and harmoniously rounded. : Harmoniously raised towards the belly, without exaggerated tuck-up. : Not docked, reaching the point of the hock, not deviated, set below the topline. Carried obliquely, curving downwards at the root and curving more or less upwards at the tip. Strong at its root, tapering progressively towards the tip. Furnished with long wavy silky fringes starting at a few centimetres from the root, lengthening to the middle part, and then getting progressively shorter towards the tip. : The forequarters are upright. The back of the upper arm is furnished with wavy silky feathering of medium length. The feathering is distinctly longer at level of the forearm and falls to the level of the pastern. : Well attached to the chest and quite oblique (50° to the horizontal). : Length is less than one third of the height at the withers; its obliquity on the horizontal is nearly 60°. : Well defined, lean. The pastern is very slightly oblique, seen from the side. : Oval, with tight, well arched toes and strong, dark coloured nails. Furnished with hair between the toes. The pads are firm and dark. : Oval and slightly longer than the front foot, but otherwise with the same characteristics. : Seen from behind, the hindlegs are vertical; the limbs are powerful and muscled from the upper thigh to the lower thigh. Feathering at back of rear limbs particularly profuse behind the upper thighs. : Broad and quite long with powerful and very visible muscles. Its slant on the horizontal is between 65° and 70°. : Of almost equal length to that of the upper thigh, with visible muscles. : Easy, supple, even and energetic while remaining elegant. The legs move well in the axis of the body without too much up and down movement of the topline and without rolling. : Supple and well fitting to the body. : Long and wavy on the ears, falling beyond the cartilage, as well as on the back of the legs and the tail. Flat, silky and well furnished on the body with a few waves behind the neck and above the root of the tail. Short and fine on the head. : White and brown with medium spotting, sometimes getting predominant, with irregular patches, slightly or moderately flecked and roan without excess. The brown varies from cinnamon to dark liver. A white blaze and white on the head, if the marking is not too wide, are appreciated. The absence of white on the head is perfectly admissible. The edges of the lips, the eyerims and the nose are brown, without any unpigmented areas. Females 55 to 59 cm. Ear partially white, too short or triangular. Hair curly on the body. Lack of type (insufficient ethnical characteristics which means that the animal on the whole does not sufficiently resemble its fellow creatures of the breed). Overshot, undershot (tolerance for reversed bite without loss of contact). Any teeth missing (except PM1). Vicious stare or hawk eye. White patch surrounding the eye (white eye mark). Presence of dewclaws on the hindlegs. Any other colour than white and brown. Depigmentation (severely flesh coloured nose and/or eyelids).